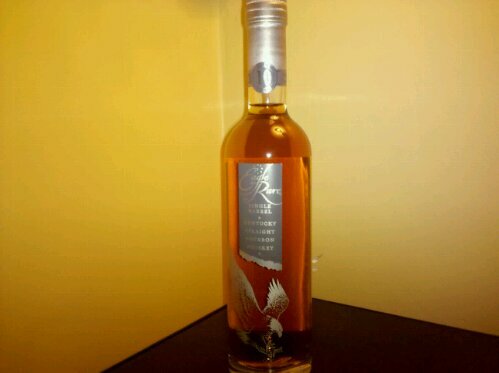 I wouldn’t think twice about recommending Eagle Rare Single Barrel as a gift this holiday season. The casual bourbon lover will definitely appreciate flavors while the bourbon aficionados will dig the complexity. A little back story – Eagle was introduced in 1975 by Charles Beam for Seagram’s and was apparently meant to compete with Wild Turkey at the time. It was one of the last bourbons introduced prior to the current focus on small batch bourbons which began late 80s. The brand has changed hands several times over the years and is now part of the Buffalo Trace family. The two currently available varieties are the 10 year Single Barrel (90-proof) and the 17 year ‘Antique Collection’ (also 90-proof). What makes the 10 year unique is that the whiskey is not blended, but bottled individually from each charred barrel. This creates a unique tasting experience which is probably why it has won a nice stable of awards over the last several years. Eagle Rare Single Barrel is a very nice bourbon. The amber color is rich and enticing. The aromas, while not overwhelming, are adequate. I get a hint of orange peel there and maybe some wildflower. Eagle starts mild then explodes with bold flavors of honey, oak, tobacco, and leather with a distinct sweetness. It finishes very, very long with lingering flavors of toasted almond. This is the kind of finish that really suits me. I give it much-deserved high marks. This entry was posted in Bourbon Reviews. Bookmark the permalink. First time Bourbon drinker. Tried this based on your recommendation. It will make a Bourbon fan out of anyone. Very easy to drink on the rocks. This is a basic blog o' bourbon reviews with some color commentary of the bourbon industry sprinkled in.